HOW IS IT GREAT? A bowl win is always great. Especially when it's your 6th-straight bowl win. Throw in some stellar plays by Eric Weddle, a kicker with a leg of gold, and a hook-and-ladder for a TD, and you've got the #29 game on our countdown. It seems fitting that Utah concluded such a painful season in a second-class Bowl game against a mid-major opponent. The Utes went into the game with seven wins and five agonizing losses that I won't mention any further. The Armed Forces Bowl didn't seem like the type of venue where the Utes could fully redeem themselves. However, the Utes weren't just trying to save a season, they were sustaining a bowl-winning streak that dated back to 1999- the second longest in the nation. Plus, they were looking to send some key Seniors off in style. With this in mind, the team showed up and took care of business against the Golden Hurricane. It wasn't a blowout, yet it wasn't exactly a nailbiter either. Just a solid bowl win against a respectable team & coach on national TV. 2007 RANKING: #29. It wasn't the sexiest win, but they got the job done with class and made us all proud. This game would have ranked higher under slightly different circumstances (such as a better Bowl/date, better opponent, or had Utah won a couple more games during the season). Still, the fact that this was Utah's 6th-straight Bowl win, coupled with Weddle's awesome performance, makes this game a must-have for any Utah Football DVD library. It also ensures a spot for this game in the Top-35. FORT WORTH, Texas — The streak continues. Utah extended its run of postseason success to six games with a 25-13 victory over Tulsa in the Bell Helicopter Armed Forces Bowl. "It feels great. They all feel good," Ute coach Kyle Whittingham said. "After the tough way we ended the regular season it's very sweet — a great way to go out for the seniors." 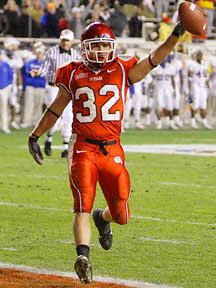 All-American Eric Weddle finished his career with another stellar performance and a 4-0 record in bowl games. "I was ecstatic with how we played today. We made plays in the end to cap off an average year by our standards," Weddle said. "But it was good to get a bowl win and show what kind of team we are." The Utes bounced back from a bitter 33-31 loss to BYU on Nov. 25 to finish the year 8-5 and with some momentum. "We take these bowl games seriously," sophomore Brent Casteel said. "And to take this win into next season is gratifying." Kicker/punter Louie Sakoda was named the game's most valuable player. He made four field goals and averaged 47.3 yards on three punts. "It's completely unexpected," Sakoda said of the award. "Hopefully I'll keep getting stronger every year and I can keep helping the team." Utah used a balance of experience and youth to add a victory in Fort Worth to previous postseason wins in the Las Vegas, Liberty, Fiesta and Emerald bowls. The winning streak dates back to 1999 and now includes a run of four consecutive years. "The group of people in this country that have played in four bowls and won all four is minute. It's rare," Whittingham said. "Our seniors have done that." Safety Steve Tate, who led the Utes with 10 tackles, said it was a team effort that got the job done. "We had some ups and downs in the game," he said. "But we kept steady." And in bowl games, the junior noted, the team that does the best job doing so ends up winning. That isn't to say, however, that there weren't a few peaks and valleys along the way. Just when it appeared Utah had wrapped things up, Tulsa stormed back. "I thought our team played hard and that's all I ask our team to do. I don't judge our team on results but by the way they play," Tulsa coach Steve Kragthorpe said. "Our team played extremely hard." The Golden Hurricane closed the score to 19-13 with 10:54 left in the game on a 2-yard touchdown plunge by quarterback Paul Smith. An interception set things up. Tulsa free safety Bobby Blackshire picked off a pass from Brett Ratliff, who had an otherwise solid outing with 240 yards and 23 completions, and returned it 18 yards and into Utah territory. After the Tulsa touchdown and an exchange of punts that followed, the Utes turned to Weddle down the stretch. And he got the job done — both offensively and defensively. Weddle ran the ball on seven of eight plays in a game-clinching drive downfield. He concluded the sequence with a 4-yard touchdown run with 1:05 left to play. For good measure, Weddle closed things out with a game-ending interception. "What more can I say about Eric?" Whittingham said. "It's very fitting that the final interception was Eric's and that the game-winning drive at the end there was Eric Weddle's show all the way." The Utes broke open a tight game by scoring on their first drive in the second half. A 10-yard touchdown play — a hook-and-ladder — highlighted the series. It featured a pass from Ratliff to Brian Hernandez, who handed the ball off to Casteel. Casteel made a spectacular dive into the left side of the end zone to help Utah extend its lead to nine points. "We've been practicing that play for about a week now. It worked good all week," Casteel said. "We felt like it was a strong play to use and it turned out to be." It swelled to 19-7 when Sakoda contributed another field goal (a 41-yard kick) before the third quarter was complete. Sakoda gave Utah a leg up in the first half. The Mountain West Conference's co-Special Teams Player of the Year made three field goals to give the Utes a 9-7 advantage. Sakoda's first kick was a career-best 45-yarder with 7:50 left in the first quarter to break a scoreless tie. The lead, however, didn't last for long. Early in the second quarter, Tulsa pulled ahead when Smith scored a touchdown on a 1-yard keeper. It capped a 10-play, 80-yard drive for the Golden Hurricane. Trailing 7-3, Utah once again turned to Sakoda. He drilled a 39-yarder to cut into the deficit and later added a 41-yard kick as time expired to put the Utes back on top. The latter came after both teams were unable to capitalize on an exchange of turnovers late in the quarter. Four plays after Weddle recovered a fumble for Utah near midfield, the Utes gave the ball back to Tulsa when Ratliff tried to scoop up a loose ball and it was pounced on by nose guard Brandon Jones. The Hurricanes, though, were eventually forced to punt. That opened the door for Sakoda's go-ahead field goal, a play set up by a 24-yard pass from Ratliff to Marquis Wilson with just two seconds to go in the half. #9: 1930 - Utah vs. Utah A.C.